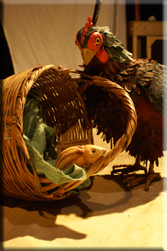 Little Angel Theatre announce their new production of Handa's Hen by Eileen Browne. This engaging, interactive play is for 2-5 year olds. Based on the book by Eileen Browne, the show boasts 55 puppets all newly created for this production. When Handa and her friend Akeyo go looking for Grandma’s black hen Mondi, they find many other animals, birds and insects in ever increasing numbers. Two butterflies, three mice, four lizards, five sunbirds, six crickets, seven baby bullfrogs, eight spoonbills and nine starlings come to light until the missing hen is found – with ten baby chicks. Learning to count and an introduction to African wildlife are served up for the very young in a colourful and fascinating manner. Back in 2003, Little Angel Theatre began a research and development period focused upon work for the very young and their parents and carers. The programme was called Learning to Play; Playing to Learn and the outcome was the specially commissioned trilogy (collectively called The African Trilogy) of staged plays for 2-5 year olds based on three of Eileen Browne’s books. The three plays were all hugely popular and successful and helped to create the theatre’s now buoyant audience of 5 and under’s. The Little Angel Theatre is the oldest purpose built puppet theatre in London. Founded by John and Lyndie Wright in 1961, the theatre has established itself as the home of British puppetry. The Little Angel exists to celebrate, explore and develop diverse forms of puppetry for children and adults. It celebrates its 50th anniversary in 2011. Book signings with Eileen Browne will take place after the 10 and 11.30 am performances on Saturday, 9 May. Books will be on sale from the Little Angel Shop. Please note that babies and children under the age of two will not be admitted to the auditorium. Dates and Times: Wednesdays – Sundays 25 April to 5 July 10 am/11.30 am/1.30 pm every day except Fridays 1, 8, 29 May and 5, 26 June when the show will be at 5 pm instead of 10 am.